As winter once again returns to Wooster, we are forced to reckon with the realities of the season: unpacking our warmer clothes, identifying the routes to class that minimize outside time, drinking as many warm beverages as possible and working on our snowball-throwing aim. Yet while there are plenty of fun things associated with the winter months, many people struggle with negative feelings brought on by the cooler, darker days. According to a 2008 article published in the journal Psychiatry, six percent of the U.S. population suffers from Seasonal Affective Disorder (S.A.D. ), while fourteen percent suffer from seasonal mood changes known as the winter blues. Symptoms include decreased energy and increased appetite, withdrawal from relationships and general disinterest in personal activities, which can cause the several months of winter to be difficult to get through. 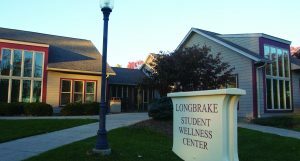 According to Ray Tucker, director of the Longbrake Student Wellness Center at the College, many of the treatments available for easing S.A.D. and the winter blues stem from lifestyle changes that a student can make in their daily activities. “Winter is a great time to reflect and slow down, but it’s also a great time to get active with activities and people you enjoy. It’s up to you to decide which sorts of solutions are best for you, by asking ‘How do I make winter worthwhile for myself?’” Tucker said. In addition to the public lamp, the Wellness Center has five sun lamps available for loan to students, and Tucker notes they are hoping to implement a program with Residence Life to eventually install them in residence halls. The Wellness Center also offers additional suggestions for increasing Vitamin D intake, which can help ward off the winter blues; foods like carrots, squash, broccoli, fish, eggs, cheese and avocado are available in Lowry, and can provide as much Vitamin D as a supplement can.